You have seen the rest, now see the best! There is no doubt that this is the most authentic ABBA show to date, featuring original band members including Ulf Andersson & Janne Schaffer (among others). Featuring classic songs such as Waterloo, SOS, Mamma Mia, Dancing Queen, Money Money Money, Knowing Me Knowing You and many more, this promises to be the must-see event! Children below 3 years old may be admitted free of charge provided they do not occupy a seat (they must be seated on the lap of a parent or guardian). Children 3 years old and above must purchase a ticket for admission. All children below 12 years old must be accompanied by a parent or guardian. For the enjoyment of all audience members, all events start promptly at the time printed on the ticket. Please be seated 15 minutes before the performance start time. Late arrival may result in non-admittance until a suitable break in the performance. All DSLR / Cameras with interchangeable lens are strictly prohibited inside the auditorium and must be checked in into the Theatres Cloak Room. 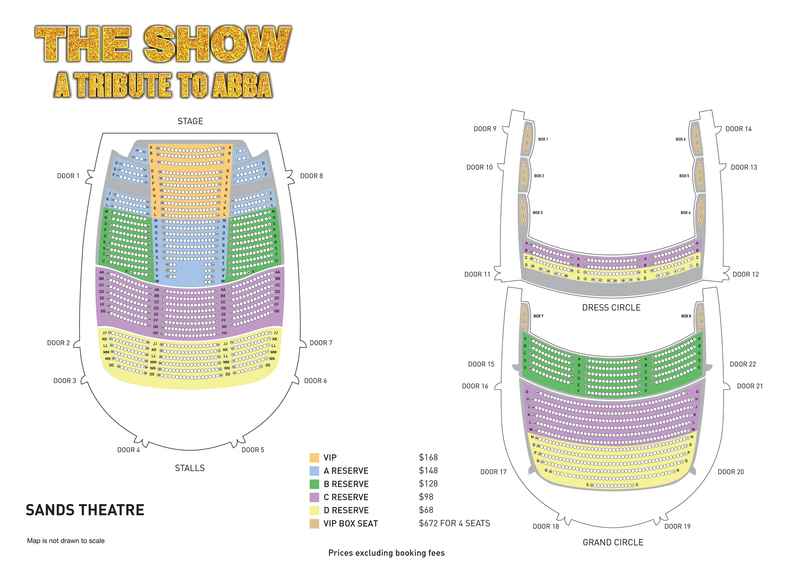 Booster seats are available on a "first come, first served" basis from 1 hour prior to show up until show time. Booster seats are not guaranteed and are not included with the purchase of your ticket. Patrons are welcome to bring their own booster seats. Booster seats provided by Marina Bay Sands may not be taken out of the Theatre Foyer at any time. BUY TICKETS Loading now.. SHOW & DINE Loading now..